For Pictures of Mumbai’s Best Ganesh Idols in 2016 and 2015, please visit this page ==> Photos Of 2016 Mumbai Ganesh Chaturthi, Ganesh Idols; and Photos of 2015 Ganpati Idols, Ganesh Chaturthi in Mumbai. Article has pictures of Mumbai’s most popular and best Ganesh idols (“Murti”), “Pandals” and “Mandaps” in 2013. It also has information on Ganesh Chaturthi dates, Ganesh Visarjan (Immersion), auspicious Ganesh Pooja time and Ganesh Mandals. These are photos of the best and most well-known Ganesh Idols and Ganpati “Mandals” in Mumbai in 2013. GSB Seva Mandal is the richest Ganesh “Mandal” (Ganesh Festival Organizers) in Mumbai. This is GSB Mandal’s 59th year; a mandal that was started by Goud Brahmins. GSB Ganesh idol is 12 feet tall with over 70 kgs of gold and 297.5 kgs of silver on the murti (idol). All four arms of the Ganpati statue are covered with gold. GSB Mandal is insured for Rs 223.35 crore (2,233.5 million) of which Rs 20 crore each are for risk cover of the Idol and public; Rs 180 crore is accident cover for the workers and volunteers of the Mandal. Incidentally, this year’s insurance amount is less than last year’s insurance of Rs 224 crore. GSB Seva Ganesh is among the more eco-friendly of Mumbai’s large Ganpati Mandals. Clay and grass is used in making the GSB Ganesh idol, unlike other big Ganpati statues that use POP. The GSB Mandal does not play film music,, complies with noise regulations and uses loud speakers sparingly for announcements. GSB Seva’s Ganesh is housed in a 90,000 sq feet wooden mandap at King Circle, near Wadala. Panchsheel Mandal at Mumbai Central (East) has one of the most stunning Ganesh Idols in Mumbai in 2013. Last year Panchsheel Niwas Rahivashi Seva Mandal had won the Times of India’s Reader Choice award for Ganapati murtis. Mumbai’s Khetwadi Galli 11 Ganpati Idol is known as “Mumbai Cha Maharaja”. At 28 feet, Khetwadi Gali 11 Ganesha, “Mumbai Cha Maharaja”, is among the tallest Ganesh idols in Mumbai in 2013. Mumbaicha Maharaja Ganesh is a “Musakavahana” (riding on a rat). The Ganesh idol is standing on a mouse called “Mushakraj” or “Kroncha”. Mumbai’s Khetwadi Galli 12 Ganesh Idol is known as “Khetwadi Cha Ganraj”. Khetwadi Gali 12 Ganesha, “Khetwadicha Ganraj”, is one of Mumbai’s best Ganesh Idol and Mandal. Khetwadi Galli 12 Ganesh is housed in a beautiful mandap. 2013 “Parel Cha Raja” (Nare Park) Ganpati Idol is based on Ganesha’s father Lord Shiva. Parelcha Raja is blue in color and has a muscular body like Lord Shiv. The usual big belly is missing and the statue is standing. Parel Sarvajanik Ganesh Utsav Mandal (Bhivajirao Narepark) has been hosting “Parelcha Raja” since 1947. Rajan Khatu’s workshop has built “Parel Cha Raja” (Nare Park). Ganesh Gully’s “Mumbai Cha Raja” is probably the most visited Ganapati Idol after “Lalbaugcha Raja”. 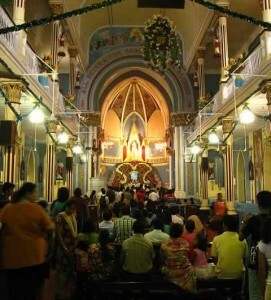 Over 1,500,000 devotees are expected to visit “Mumbaicha Raja” in 2013. The Ganesh Galli organizers (Lalbaug Sarvajanik Utsav Mandal) have recreated Gujarat’s “Somnath Temple”. The Ganesh Gali Somnath Mandap is the work of Aman Vidhate and his team; it is 75 feet tall and spread over 10,000 sq ft. The 22 feet high “Mumbai Cha Raja” is among the taller Mumbai Ganesha statues. 5 Kgs of gold ornaments are placed on the Mumbaicha Raja. This is the 86th year of Ganesh Galli Ganapati. Donation collected will be given for Uttarakhand flood relief. The mandal follows a strict policy of skirts for girls and no short pants for boys over the age of 13. Chandanwadi’s Ganesh Idol is among Mumbai’s best Ganpati idols (“murti”) of 2013. The standing eight-hand Chandanwadi Ganesh Idol has Vishnu’s “Sheshnag” (five headed snake) over his head. Last year’s Vijay Khatu designed Chandanwadi Ganesha idol was voted 2nd Runner Best Ganpati Idol by TOI. Fort Icchapurti Ganesh “Mandap” (or “Pandal”) is a beautifully constructed replica of Mysore Palace. Fort Icchapurti Ganpati is designed by Vijay Khatu and the art director of the Mandal is Anand Sawant. The Tulsiwadi, Tardeo Ganesh Idol is an unique orange coloured statue. 300,000 artificial diamonds were used to make this amazing Ganesha Idol. Tulsiwadi Sarvajanik Ganesh Utsav Mandal expects around 400,000 visitors during the 2013 Ganeshotsav. The 2013 “Khetwadicha Raja” (Khambata Lane) is an interesting Ganesha idol which looks a lot like Lord Shiva. It has 11 snakes (“Sheshnag”) on its head. In all, Khetwadi has 21 large Ganesh Mandals. Khambata lane is the broadest lane in Khetwadi. The Khambata road Sarvajanik Ganeshotsav Mandal (SGM) was established in 1970. Khetwadi “Viganaharta” (destroyer of evil) Ganesh is located between 2nd and 3rd Lane in Khetwadi, Mumbai. Khetwadi Vignaharta Ganpati is a “Pancha Mukha” Ganpati (five headed Ganesh) sitting on a lion. The 2013 Khetwadi Galli (Lane) 7 Ganesha is an unique Idol with Lord Ganesh standing on a Mace (“Gada” in Hindi), which in turn is held by a hand. “Navsala Pavnara” (one who fulfils wishes) “Andhericha Raja” is a special Ganpati idol whose design has remained unchanged for 47 years. 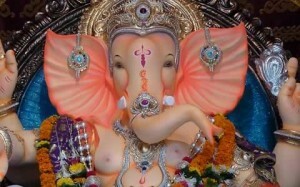 “Andheri Cha Raja” mandal (Azad Nagar Sarvajanik Utsav Samiti) has applied for a copyright for the 8.5 feet Ganesh Idol. AndheriCha Raja murti is made by Rajan Khatu. “Chinchpokli Cha Chintamani” Mandal (Chinchpokli Sarvajanik Utsav Mandal) was founded in 1920. It is one of Bombay’s oldest Ganesh Mandals. “ChinchpokliCha Chintamani” has a special symbol on his throne. This is designed by calligrapher Achyut Palav. Listed below are Winners of Times of India’s 2013 Ganesh Utsav Best Ganpati Idol and Mandal contest. In 2013 Ganesh Chaturthi start date is September 9, 2013 and Ganpati Visarjan (Immersion) is on September 18, 2013. Gauri Visarjan is on September 13, 2013. Ganpati Visarjan Date in 2013 (last day of Ganesh Chaturthi): September 18, 2013 (Wednesday). As per Hindu calendar, 18 Sept, 2013 is “Anant Chaturdashi”, the day when Ganesha “Murtis” (Idols) are immersed in water bodies (sea, river, lake, ponds). “Ganpati Visarjan” (Ganpati Immersion) is a symbolic send-off for Ganesha who now travels to his home in Mount Kailash. As per the Indian Hindu calendar, Ganapati Visarjan occurs on “Anant Chaturdashi” and is also called “Vinayaka Nimarjana” (Telugu), “Ganesha Visarjane” (Kannada). Ganesh Visarjan brings to an end the Ganesh Utsav (Festival). NOTE: Many Central Mumbai Ganesh Mandals, such as Lalbaughcha Raja, Ganesh Gali Ganpati, prefer to immerse their Ganesh Murtis in Girgaum Chowpatty rather than Dadar Chowpaty. NOTE: BMC (Mumbai Municipality), usually creates 22 artificial ponds for devotees to immerse their idols. Worshipers, organizers and devotees are requested to use these artificial ponds for Ganapati Visarjan, since they are less damaging to the environment. Mumbai’s Siddhivinayak Temple has declared auspicious “Madhyahana Puja” (Ganesh Puja) time from 11:22 am to 13:49 pm. As per legend, Lord Ganesha’s birth took place during “Madhyahana Kaal” (midday). Hence, devotees prefer to perform Ganesh Puja (prayer) or Ganpati Aarti around midday. Auspicious Ganpati Aarti time may vary depending on place. 11:25 am to 1:30 pm is a good time to perform Ganpati Pooja during the 2013, Ganesh Chaturthi festival. Ganesha Chaturthi celebrations in Mumbai are unique. Large public Pandals and Mandaps (temporary structures) with Ganpati idols are set up throughout the city. 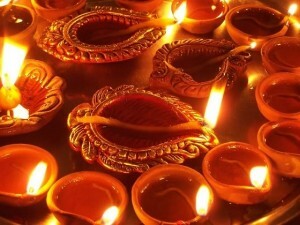 It is a mass public festival with aarti/puja/prayers twice a day. Large crowds of people line up to pay their respects to Ganapati. The festival culminates with the immersion of the Ganpati Murti either in the Arabian Sea or local ponds and water bodies. Mumbai’s tradition of large public Ganesh celebration (“Sarvajanik Ganeshotsav”) was introduced by freedom fighter Lokmanya Tilak, in 1893. In those days, India was under British rule and large gatherings were not allowed. Tilak started mass Ganapati street celebration to protest against the British, unite Indians (especially Brahmins and non-Brahmins) and to spread the message of independence (“Swaraj“). Mumbai has around 10,500 registered Sarvajanik Ganesh Mandals. It is estimated that during Ganesh Utsav around 200,000 Ganesh idols are installed in Mumbai, of which 95% are in the houses of Mumbai’s resident. Some of Mumbai’s most famous Ganesh Idols and Pandals are LalBaugCha Raja, Ganesh Gali Ganpati, GSB Seva Mandal, Khetwadi 12 Galli, Khetwadi 11 Gali, Kethwadi 7 Gali, Chinchpoklicha Chintamani, Fort Icchapurti Ganesh, Teli Gali Ganesh, Parelcha Raja, Nare Park, Borivali Upnagarcha Raja, etc. Mumbai celebrities who keep Ganpati include Salman Khan, Nana Patekar, Jeetendra, Shilpa Shetty, Akshay Kumar, Rani Mukherjee, Suniel Shetty, Jackie Shroff, Govinda, etc. The Kapoor’s R K Studios in Chembur keeps a Ganpati murti for full 10 days. Many of Mumbai’s large Mandals use Plaster Of Paris (POP) for their Ganesh Idols. POP allows Ganpati idol makers to create large and complex Ganapati idols. Unfortunately POP has an adverse impact on the environment. Sadly, not many Mumbai Mandals and Pandals have environmentally friendly Ganpati Idols. As environmental awareness has increased, so has the popularity of natural clay Ganpati idols. Natural clay is also known as “Shadu”. Why is Ganesh Chaturti (Ganesh Festival) Celebrated? Ganesh Chaturthi is celebrated because Lord Ganesha was born on this day. Ganesh is the son of God Shiva and Goddess Parvati. According to legend, once there was no one to guard Goddess Paravati when she wanted to take a bath; so Parvati created Ganesha from turmeric and sandalwood paste to stand guard for her. While Ganesh was standing guard, his father Shiva arrived and asked that he see Parvati. Shiva was not aware that Ganesha was his son. Ganesha refused to let Lord Shiva see his mother. This angered Shiva and he cut off Ganesha’s head. When Parvati learnt of Ganesha’s death, she took on the form of Adishakti, the primordial power who has the ability to destroy the entire universe. To prevent destruction, Lord Shiva relented and replaced Ganesh’s head with the head of a dead elephant cub. Shiva christened his son Ganesha (Lord of the Ganas) and declared that henceforth Ganesha will be worshiped by everyone before starting any activity. Lord Ganesha is the Hindu God of Intelligence, Prosperity, Arts, Sciences and the Remover of obstacles; hence before starting any new venture, Hindu’s invoke Lord Ganesh’s name. Lord Ganesha has many names, of which the popular ones are Ganpati, Vinayaka, Siddhivinayaka, Vighneshvara , Kirti, Omkara, Pille, Pillaiyar, Aiyanayaka, Tarun, etc. The “Ganesha Sahasranama” contains the 1000 names of Lord Ganesh.